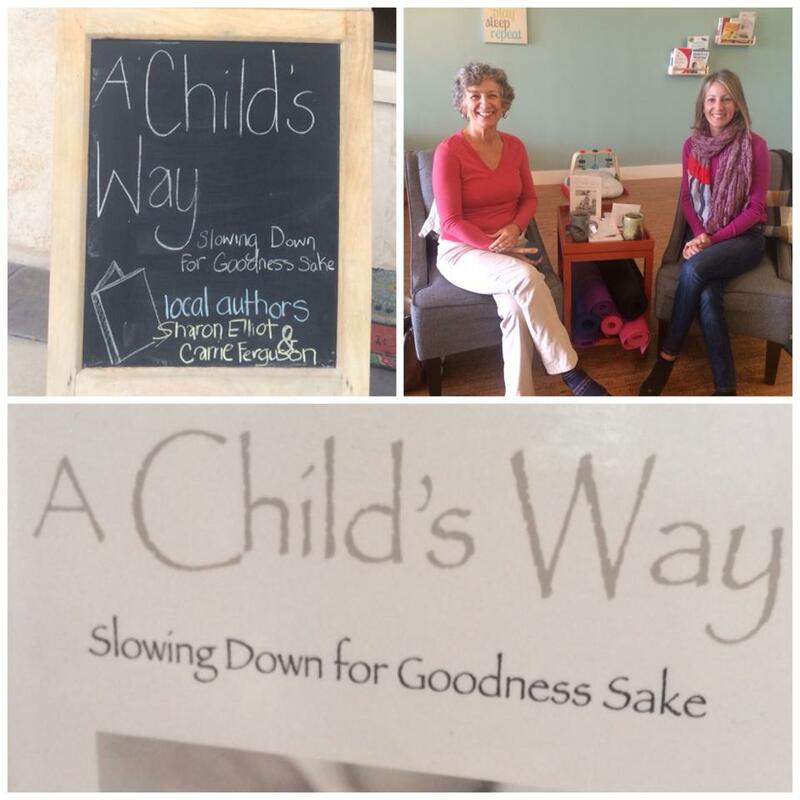 My mom, Sharon Elliott, and I were at locally-owned, play-focused destination Bay & Bee on November 18 to present our book, A Child’s Way. Here’s a wrap up of our exploration. One of the first things I noticed when I walked into the Bay & Bee playspace was a toddler with a wooden train boxcar in each hand. She was talking quietly to herself and touching the magnets of the boxcars together. She put them on the track and rolled them. She was completely engaged in her play, with her back to her mother, and did not notice me noticing her. Her mom was curled in a comfy popasan chair, watching. There it was- a perfect image to match the conversation around our book, A Child’s Way, which is about slowing down and considering: What have our children come to teach us? This particular mom was not directing her daughter’s play, nor was she asking questions, like “what color is the train?” She was giving her daughter the opportunity for self-initiative, while her presence was still “with” the child. She was also giving herself a nice little rest, while her daughter was doing exactly what she needed to be doing for her own development. When we are really present with our children, when we engage eye-to-eye and have those touchstone moments of heart connection throughout the day, we create a rhythm of being together, and being independent. In other words, once they’ve had our complete attention, they will be ready to do the things they need to be doing on their own because they take our felt presence with them. What they end up doing are things that are vital to their growth as human beings. 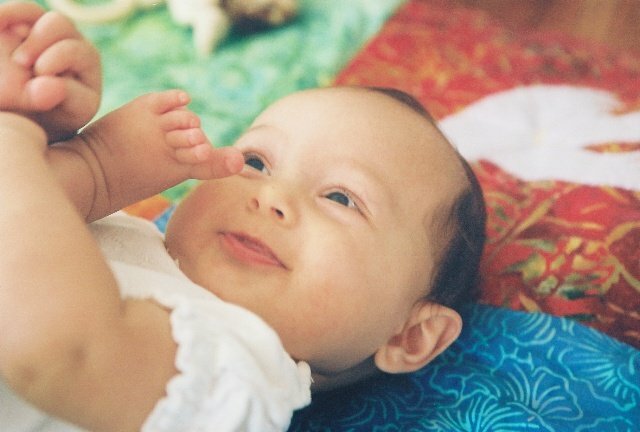 For example, the infant lying on her back, and later turning over, lifting herself up and crawling is experiencing crucial developmental movements that are related to later academic learning. This rhythm of both presence and independence is a daily practice that helps us: understand our own needs with those of our children, and create the relationships we want with our children- who challenge us and teach us what matters. While we have been efficient, effective and accomplished in other areas of our life, children remind us that not everything can be condensed down to lists, techniques and how to’s. The truth is we are not happy unless our heart is involved. Is it for efficiency, or for noticing what my child is noticing? Is it for teaching my child something, or for him to teach me? Is it for getting the job done effectively or remaining true to myself and what I love? Every moment is designed for you. No book, no person, no technique has your answers. What if you and your child were giving each other the joys and challenges that are exactly what each of you need? It was absolutely wonderful to be at Bay & Bee, where the gift of a space to be is provided for both parent and child. Thank you to Monica and Zuzia! Bay & Bee is now a retailer of A Child’s Way.